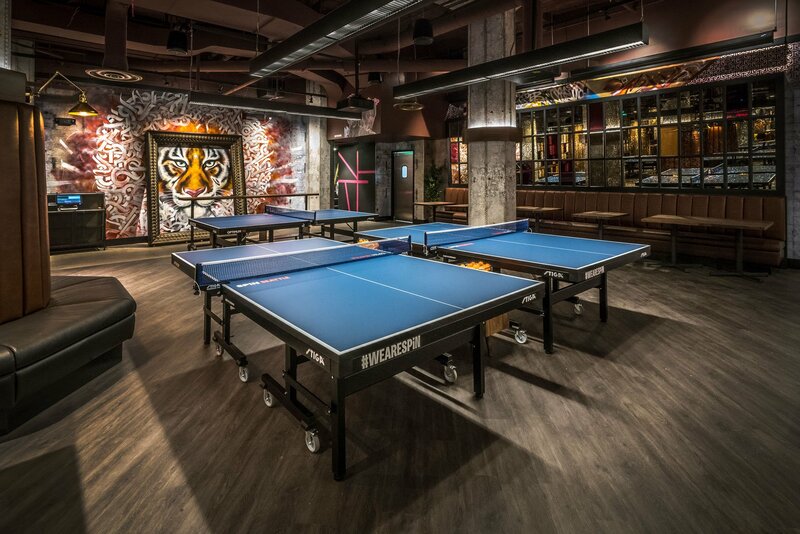 ARCO/Murray recently completed an 11,000 square-foot ping pong social club for SPiN Global in Seattle, Washington. The new entertainment facility features two bars, VIP playing area, center court, host and retail area, and kitchen. The entryway on 6th street showcases a new awning with LED backlit signage. The basement is furnished with custom wallcovering and decorative lighting, as well as an extensive millwork package including a new custom host desk, banquettes, drink rails, barn doors, a DJ booth, and back bars with vintage speakers. Graffiti artwork by local Seattle artists covers the walls, floors, and main bar die wall to complete the vibe throughout. ARCO/Murray built the first new facility for SPiN in Chicago in 2016. Since then, ARCO/Murray has been building all of SPiN’s stores across the country, including locations in New York, San Francisco, Philadelphia and Seattle. SPiN is now bringing their concept to Austin and Washington DC in 2018 with ARCO/Murray as their dedicated construction partner.